The role that nutrition plays in keeping your dog healthy is absolutely critical. 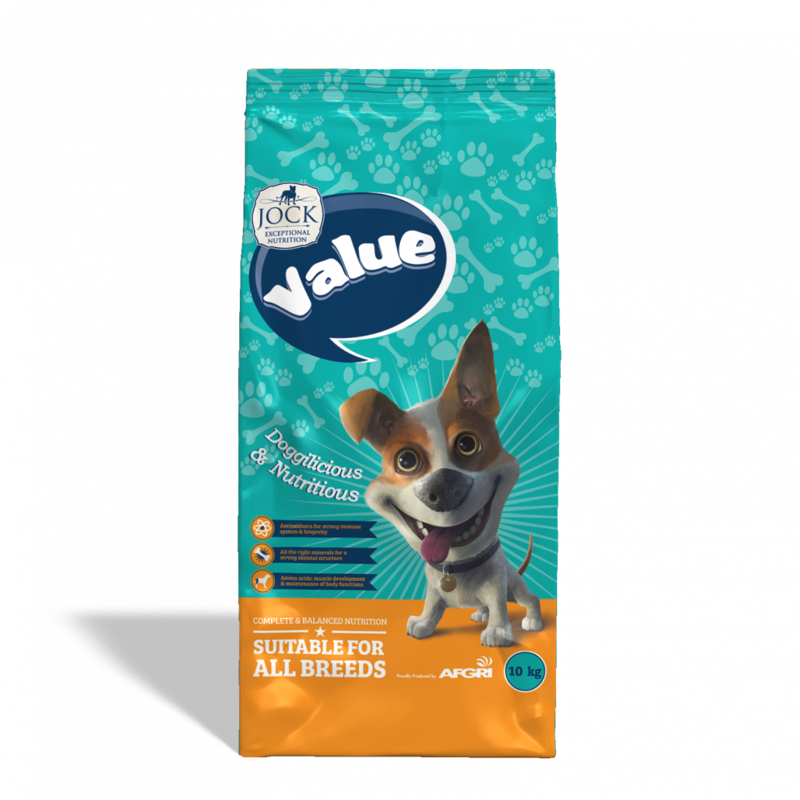 JOCK Value is specially formulated to completely address these needs and keep your pooch a few steps ahead of the rest. The secret lies in our protein-rich formulation, which is loaded with the 10 essential amino acids. These key nutrients are vital for your dog’s health and help maintain and build muscle strength. JOCK Value is also a rich source of antioxidants, thanks to added vitamin C and E.
These powerful elements, along with a combination of essential minerals, help limit the damaging effects of free radicals in your dog’s body and help support overall health. Add to this our carefully selected premium ingredients and you have a dog food that is as delicious as it is nutritionally sound. 10kg , 25kg and 40kg pack sizes (bags). Cerals*, Derivatives of Vegetable Origin, Meat & Animal Derivatives, Vegetable Protein Extracts, Fats & Oils, Minerals, Vitamins and Approved Antioxidants. *Contains at least 5% Genetically Modified Organisms. Feeding guidelines only serve as reference. Body condition of your pet should always be considered. Ad lib supply of water is recommended. Want to get your paws on a bag of JOCK Value?